The 40 litre Butterfly Twin Compartment Kitchen Bin from EKO features a ‘butterfly’ lid that opens for maximum clearance. The rectangular recycler has two inner buckets to make separating rubbish from recycling easy. Designed with new digital motion sensor technology that has been engineered to last over 20,000 openings and closing on one set of batteries. The recycling waste bin also boasts damper closing lid technology, offering a slow, soft and silent close. Crafted from stainless brushed steel with a fingerprint and rust proof finish, the sensor bin is a smart recycling and space saving solution for your office & kitchen. This slimline twin compartment kitchen bin fits a 40 Litre twin, dual recycling capacity into tight spaces. 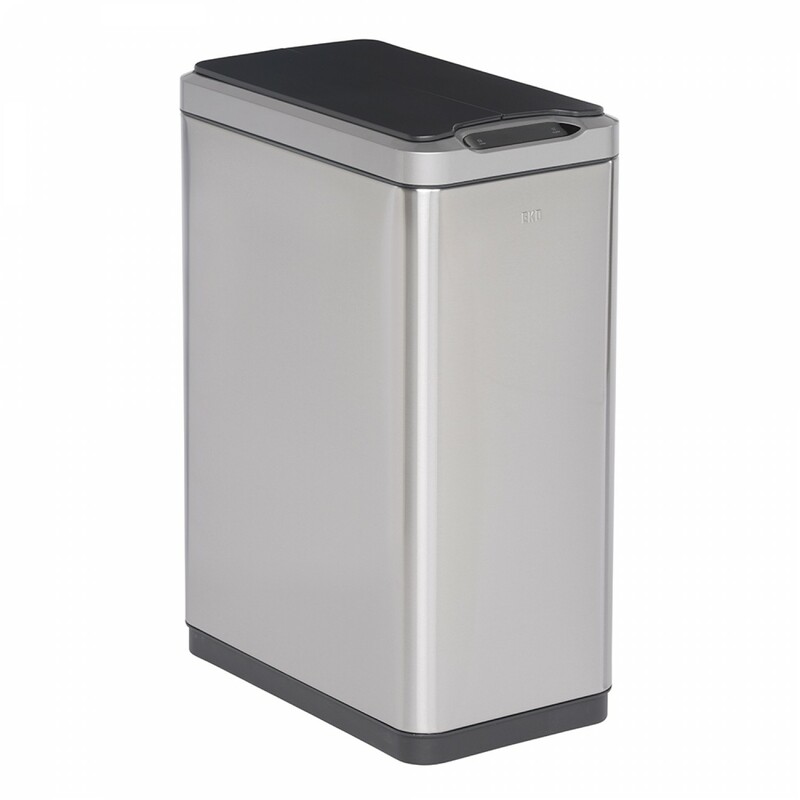 It's only 27cms wide but holds two 20L inner buckets, making it an ideal kitchen bin for sorting out your recycling. 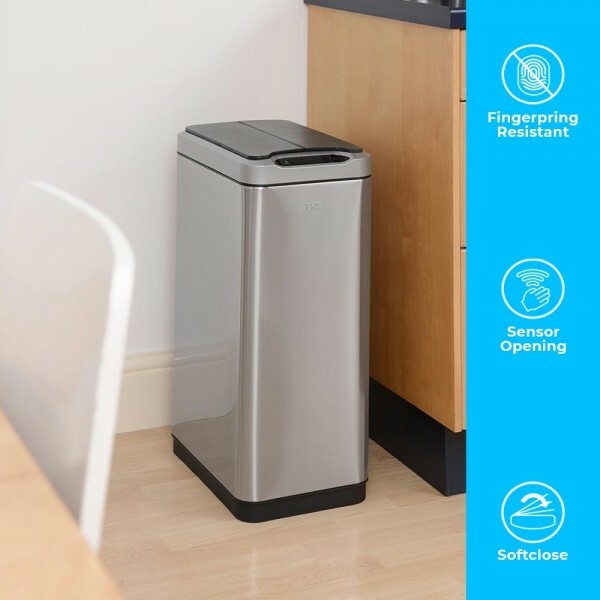 The Phantom Waste Recycling Sensor Bin has a built-in motion sensor that detects movement and automatically opens the lid of the bin, allowing for hands-free operation, reducing cross contamination around the home. The digital touch screen indicates a 5-second countdown prior to automatic soft and silent closing. Should you wish, the twin compartment kitchen bin can also be operated in ‘manual mode’ using the ‘open’ and ‘close’ buttons - battery power is still required for this. The motion sensor on this bin requires 6 x AA type of good quality batteries, giving around 20,000 open/close operations. Batteries are not included. The butterfly opening style of the lid means that this bin has an overall height when open of just 77cms. It aligns neatly alongside a run of kitchen units or well placed at the end of an island. Please note, like most sensor bins, it is not suitable for placing completely underneath standard countertops - just ensure the front panel is not covered by the worktop. The bin requires a minimum of 50cm of space above it to avoid triggering the opening mechanism. Shelves or wall cabinets etc over 50cm higher than the bin will be fine. 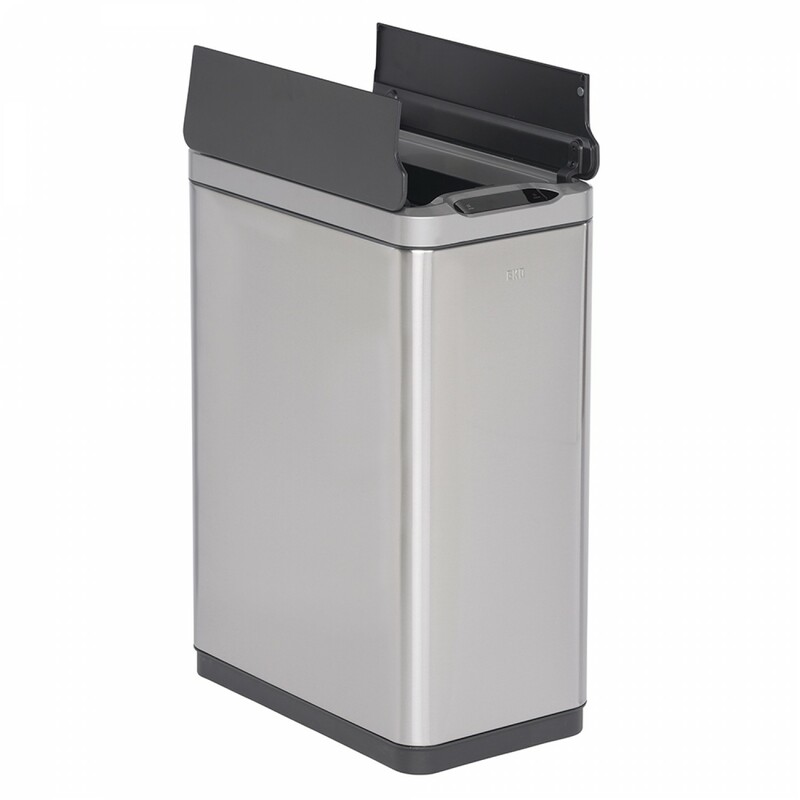 Constructed from premium 430-grade stainless brushed steel, offering anti rust corrosion resistance, this motion sensor waste recycling bin is ideal for use in humid kitchen, bathroom and laundry environments. To ensure your twin compartment kitchen bin does not become a source of unpleasant odours, the durable plastic liners can be removed and rinsed when needed. The liners also contain a plastic bag fixing hole which allows liner bags to be secured tightly, avoiding that “bag drop’ scenario. EKO uses the latest technology in the dampers on their soft-close lids to give a quality feel. The graduated closing speed, achieves faster closing, without sacrificing the soft silent close effect.